Once upon a time, I hated smoothies. In fact, I hated all drinks other than water. Why? No idea - I suppose it was a phase as I used to love them - but one day I decided that smoothies and any liquid thicker than water made me feel sick. So I steered clear of smoothies - for months, years, I don't even know how long - until one day I was making popsicles and I scooped up the last of the mixture with a spoon. 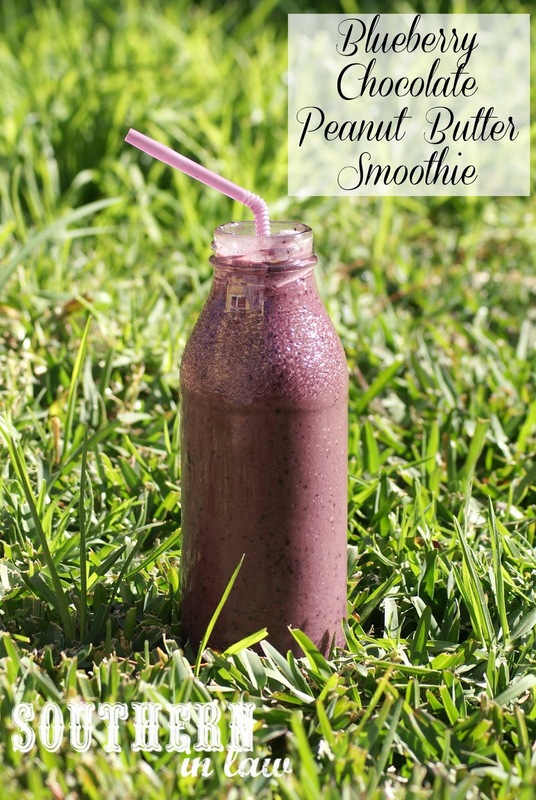 It was, essentially, a smoothie - and from there I was hooked. Lately, I've been obsessed with smoothies. Not for meals (girl needs carbs) but for snacks - and a delicious snack they are. We've been experimenting with different combinations, flavours, add ins and we're constantly coming up with new favourites. 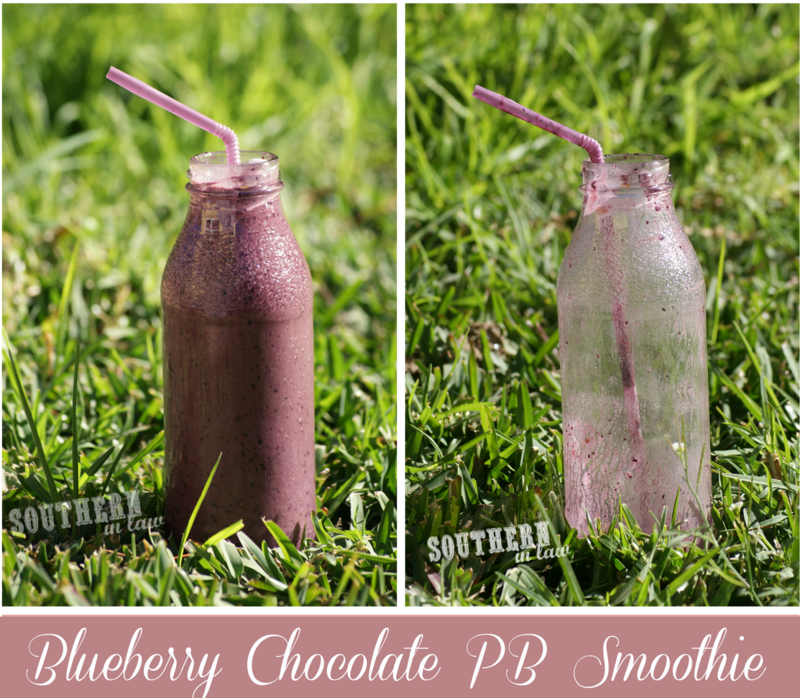 This Blueberry Chocolate Peanut Butter Smoothie (which I'm shortening to Chocolate PBerry Smoothie) is one of our current favourites - and Jesse's absolute favourite. He thinks it tastes just like peanut butter, but I think it tastes more like chocolate - so if you make it, be sure to tell us what you think! Place all ingredients into a blender. Blend until smooth and pour into a glass. But tell me, loves, what is your go-to snack right now? Really cracking recipe. Glad to have stumbled by such a strong and productive fellow food blogger! Keep up the work. I just posted pretty much the same smoothie 2 weeks ago! It is my favorite combo and have probably made it my smoothie of choice the last 20 times I took out my blender. 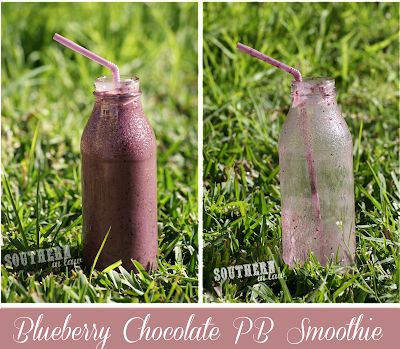 Peanut + Chocolate + Blueberries = flavor Heaven! P.S. Congrats! Yay for Celiac friends! You have to add Spinach! I never have a smoothie with out it! I have put cups and cups in my smoothies and it does NOT give off any weird taste! Tell Jesse he is missing out big time!